However, he is best remembered among Red Sox fans for the team's dramatic collapse during the 1978 season. After leading the Yankees by as many as fourteen games, the Red Sox stumbled in August. By early September that lead was reduced to four games. That lead evaporated in a four-game series against the surging New York Yankees which is still known as "the Boston Massacre." During this stretch, Zimmer made several questionable personnel moves. He never got along with left-handed starting pitcher Bill "Spaceman" Lee. The feeling was mutual; Lee nicknamed Zimmer "The Gerbil." Zimmer's outright hatred of Lee ran so deep that he gave the starting assignment in the last game of the "Massacre" to rookie Bobby Sprowl, who had only been called up from Triple-A Pawtucket a few days earlier. Reportedly, Carl Yastrzemski pleaded with Zimmer to start Lee, who, along with Luis Tiant, had dominated the Yankees during their careers. (Lee, for example, won 12 out of 17 decisions against the Yankees in 10 years with Boston.) Sprowl allowed four walks, one hit and one run in the first inning before being pulled and made only three more major-league starts. In 1996, he joined the Yankees as their bench coach for their run of four World Series titles. In 1999, Zimmer filled in for Manager Joe Torre while Torre was recuperating from prostate cancer. Zimmer went 21–15 while guiding the Yankees during Torre's absence. This record, however, is credited to Torre's managerial record. Many fans know him for his brawl with Pedro Martínez in the 2003 American League Championship Series, when Zimmer ran at Martinez and Martinez threw Zimmer to the ground. Zimmer accepted responsibility for the altercation and was apologetic to his family and the Yankees organization but maintained that Martínez was "one of the most unprofessional players" he had ever known. He was also once hit by a sharply hit foul ball batted by Yankee second baseman Chuck Knoblauch. 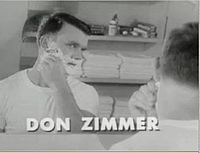 The next game, Zimmer wore an army helmet with the word "ZIM" painted on the side and the Yankees logo stenciled on the front, which was given to him by Michael Patti, a Madison Ave. advertising executive. That event led to the installation of fences in front of the dugouts at Yankee Stadium, which eventually became commonplace at most MLB ballparks. Zimmer was a senior advisor for the Tampa Bay Rays from 2004-2014. His role included assisting the team during spring training and during home games. Every year, Zimmer incremented his uniform number by one to match the number of years he has worked in baseball. During the 2014 season he wore #66,. (In 2014, longtime Tampa Bay third base coach Tom Foley wore Zimmer's name and number on the back of his own uniform in tribute.) Zimmer often noted that every paycheck he'd ever gotten came from baseball, and that he never held a job in any other profession. Zimmer grew up in Cincinnati, Ohio. At home plate before an Elmira night game in 1951, Zimmer married Soot (Carol Jean Bauerle), whom he started dating in 10th grade. Until his death in June 2014, they were still married and lived in Seminole, Florida. They had lived in the Tampa Bay Area since the late 1950s. Zimmer's son Thomas is a scout with the San Francisco Giants. Zimmer also had a daughter, Donna, and four grandchildren. A grandson, Beau, works as a reporter at WTSP 10, St. Petersburg, Florida. ^ a b c Goldstein, Richard. Don Zimmer, Who Spent 60 Eventful Years in Baseball, Dies at 83. The New York Times June 5, 2014. ^ a b Van Hyning, Thomas. (1995) "Teams for the Ages". Puerto Rico's Winter League: A History of Major League Baseball's Launching Pad. Jefferson, North Carolina: McFarland & Company. pp. 208 and 216. Retrieved 2014-06-06. ^ Torres, Angel (August 22, 2007). "Don Zimmer de los Dodgers y el origen del casco protector" (in Spanish). Retrieved June 4, 2014. ^ "Popeye the Baseball Man". www.nytimes.com. May 6, 2001. Retrieved June 19, 2008. ^ "Viva Baseball: Puerto Rico" Archived June 6, 2014, at the Wayback Machine. Baseball Hall of Fame. Retrieved 2014-06-06. 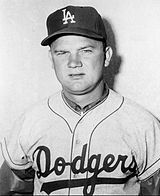 ^ "Don Zimmer: Baseball a lifestyle for lovable Zim". mlb.com. Retrieved December 2, 2008. ^ "Dome Plate". si.com. April 26, 1999. Retrieved March 28, 2009. ^ a b "Don Zimmer Minor League Statistics & History". baseball-reference.com. Archived from the original on April 2, 2015. Retrieved August 8, 2012. ^ a b c d e "Don Zimmer". retrosheet.org. Retrieved August 8, 2012. ^ Schoenfield, David. "Padres uniform history: The 1970s". espn.go.com. Retrieved August 8, 2012. ^ Shaughnessy, Dan. "Zimmer the ultimate common denominator". boston.com. Retrieved August 8, 2012. ^ "Don Zimmer Takes Over as Red Sox Manager Midway Through 1976, But Team Still Misses Postseason". nesn.com. New England Sports Network. Retrieved August 8, 2012. ^ Gammons, Peter (September 18, 1978). "The Boston Massacre". Sports Illustrated. Retrieved August 8, 2012. ^ "Zimmer Fired". The Calgary Herald. July 28, 1982. Retrieved August 8, 2012. ^ Stroop, Joe (July 29, 1982). "Zimmer's firing remains a puzzle". The Day. Retrieved August 8, 2012. ^ "MLB Manager of the Year Award Winners". baseball-reference.com. Retrieved August 8, 2012. 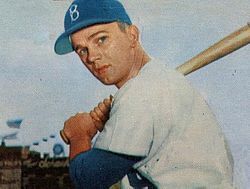 ^ a b c d "Don Zimmer #64". tampabay.rays.mlb.com. Retrieved August 8, 2012. ^ "Tempers flare during ALCS Game 3". espn.go.com. Retrieved August 8, 2012. ^ Madden, Bill (October 13, 2003). "ACHING ZIM RIPS PEDRO BUT REGRETS HIS ACTIONS". New York Daily News. Retrieved April 29, 2015. ^ "Manager and Coaches | raysbaseball.com: Team". Tampabay.rays.mlb.com. Retrieved November 18, 2012. ^ "Don Zimmer". Baseball Reference. Sports Reference LLC. Retrieved December 16, 2014. ^ "Longtime baseball fixture Don Zimmer dies at 83". ESPN.com. Associated Press. June 4, 2014. Retrieved June 5, 2014. ^ "Former Yankees Bench Coach Don Zimmer Dies". CBS New York. June 4, 2014. Retrieved June 8, 2014. ^ Topkin, Marc (January 16, 2009). "Tampa Bay Rays' senior adviser Don Zimmer recovering from small stroke". Tampa Bay Times. Retrieved November 18, 2012. ^ "Don Zimmer, iconic coach, manager, dies at 83". USA Today. June 4, 2014. Retrieved June 4, 2014. 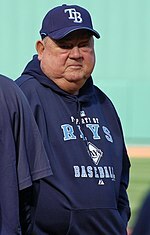 Wikimedia Commons has media related to Don Zimmer.